Next to Mhumhi was Vimbo, a semi-conscious Tareq draped over his back, and charging at them at a high speed was Hlolwa, fire and hatred in her eyes. Vimbo was just beginning to raise his tail. Mhumhi did something foolish: he stepped between the two of them. Hlolwa hit him like a juggernaut and they both reared up in a furious instant of violence, snarling and snapping, and then in another instant they split apart, quivering. Hlolwa’s sagging belly, teats hanging low, was shuddering. “I won’t let him harm-” Mhumhi began, but she interrupted him again, showing her teeth. This was an unexpected statement, and while Mhumhi recovered from the surprise she flung herself around him towards Vimbo, jaws open. Mhumhi spun and bit her on the haunch. She whirled and again they clashed, snapping and fencing. Vimbo was backing up, giggling hysterically; Tareq’s limbs hung limply from his back. Hlolwa weighed just a shade more than Mhumhi, and after a few intense seconds she got him on his side and grabbed him by the nose, snarling. Mhumhi had to give out a whimper. This seemed to snap her back from her bloodlust, and she released him, though she still looked furious. Mhumhi realized that in all the confusion and excitement of Bii stealing the puppy, he had not informed her about the rift that had opened up between him and Kutta. Hlolwa gave him a deadly stare, her pale eyes glittering. He hadn’t really been expecting an easy resolution, but strangely enough Hlolwa’s eyes seemed to flicker and she stepped off of him. She had her tail raised, and her face was stony, but she let Mhumhi get up and nudge Vimbo’s shoulder with his own, pushing him towards the little alcove of tires where Sekayi had rested. Vimbo’s head jerked up, trying to track Hlolwa over Mhumhi’s back. He was feeling a bit sour. The tension between them all aside, it had been a shoddy reminder about Kutta. He got Vimbo into the alcove, and at once the hyena’s ears pricked forward. He began sniffing all around, moving somewhat faster than he had been, so that Tareq began to slide over his haunches. Mhumhi jumped in front of him to stop him. Vimbo gave a grunt and swayed a little, and for a moment Mhumhi he was going to get surly, but then he lay down. Mhumhi pulled Tareq off, deciding to be quick rather than gentle, and arranged him on his back on the dirt. Tareq’s eyes were half-open, but he didn’t make much noise, only gazed blankly out through his lashes. Mhumhi, feeling contrite, licked his cheeks, then sniffed over his injured leg. The foot had gone sideways again. He decided to leave it for the time being; Tareq had suffered enough. Freed of his burden, Vimbo was now sniffing at a furious pace, his eyes wide and his upper lip drawn back. He scraped at the ground briefly with one blunt paw, overturning the dirt. Mhumhi saw traces of rusty dried blood there. He felt sour as he said it. He did not exactly want Vimbo to leave. Having the hyena nearby was comforting, even if he wasn’t always reliable, and Mhumhi felt as though their time spent together was getting shorter and shorter each time they met again. Where did Vimbo even go when he left? Vimbo glanced at him at the sound of his name, then nosed the loose dirt, getting it all over his muzzle. He wandered back towards the alcove entrance, then looked at Mhumhi again. Vimbo tilted his head slightly, then lumbered off. The alcove felt a shade cooler without his large presence. The sun was still sinking. Mhumhi made a discontented noise in the back of his throat and went to lie beside Tareq, chin on his paws. It felt like he had just closed his eyes when a soft scratch made his ears pick up. Hlolwa was standing at the alcove entrance. Neither of them said anything right away. Mhumhi did not raise his head, though he noticed how her eyes darted around the alcove, taking it all in. Her nostrils flared. “The hyena’s gone,” said Mhumhi. His voice sounded more petulant than he had intended. Hlolwa took little note of this statement; she had eyes, after all. She stepped down into the alcove and walked towards Tareq. Now Mhumhi’s head did come up. Hlolwa sniffed down the length of his body, her nose never quite getting close enough to touch his skin. Tareq had fallen asleep, and his chest moved up and down slowly. She seemed to examine this for a moment. Then abruptly she turned and walked back towards the entrance. She left Mhumhi speechless and walked out. He blinked, then surged up with a little growl and ran after her. “Don’t be stupid.” Her tone was derisive, which riled him up further. “Why shouldn’t I?” said Hlolwa, stalking further away, but Mhumhi dogged her. Her eyes flicked away, and she turned her head. Mhumhi came around in front of her again. “Why did you come back?” Hlolwa challenged. Now Hlolwa gave a sharp laugh. Now a little anger flared up in Hlolwa’s eyes. “I’m not interested in making more puppies with you,” said Mhumhi, voice tight. She let herself trail off, curling her lips. Mhumhi worked this through his head for a moment. Hlolwa gave a start, and then she laughed again. “You told me,” said Mhumhi. “Oh,” said Mhumhi, and sat down. She had raised her head, but her eyes were focused far away, and now her nose dropped back towards the ground. Defeat was written throughout her posture. Mhumhi studied her. 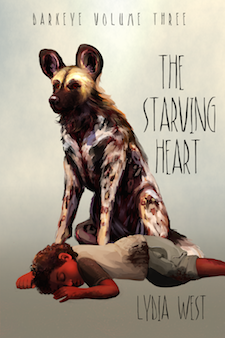 “How do you figure that?” asked Mhumhi, recalling the intimidating figures of the painted dogs that patrolled Oldtown. Now Mhumhi was the one who had to laugh; he understood that sentiment very well. He laughed again. Hlolwa gave a little twitch of her tail. Mhumhi gave a little wag of his tail, and walked with her back to the entrance to her den. She slipped inside and vanished from sight. The sun was sinking. The sky was painted with colors, sunlight lighting up the edges of clouds and making them blush pink and orange. Mhumhi took up a post near the edge of the tire stacks. He was doing quite a bit of thinking over his conversation with Hlolwa, and about Tareq, and about Kutta as well. The yap-howl of a distant jackal seemed in tune with his thoughts. As the screamers began to emerge, their eyes hungry, their hands begging, Mhumhi came to a decision. Perhaps a dangerous decision. Perhaps a foolish one. But to start it off, he had to figure out where Vimbo was staying.